Often time our web applications depend on properties that can change depending upon the environment (DEV/Stage/Production) the application is running. Examples of these include admin email addresses or URLs to communicate with web services. I am a big advocate of promoting the same war file across all the environments. In order to achieve that, I create separate property files and bundle them in the war file. Couple years ago, I wrote a custom Properties Holder implementation that would look at a JNDI key “Environment” and load the appropriate property file. Spring 3.1 introduces Environment Profiles that simplifies this entire process. In this blog, I will create a web application and three property files each holding an email address that is specific to an environment. Then I will create bean profile definitions in Spring context file and activate them external to the web application. Notice that we are using Spring’s new 3.1 schema definitions in the context file. The context file has two profiles one for test and one for production. 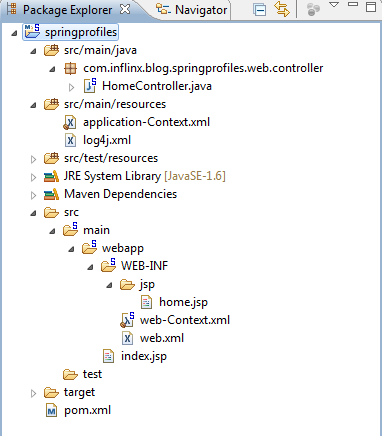 By default, Spring would load all the properties from the project_dev.properties file. Also observe that we have used the same id for all the util:properties beans.